If you're looking for a different sort of venue in New York, why not taste the culinary delights of Butter? Butter Restaurant offers three wonderful spaces available for any culinary event, be it breakfast, lunch, or dinner. These rooms include the Great Room, the Gallery Lounge, and the Birch Room, each featuring a unique wood design, providing a cozy yet elegant atmosphere right in lower Manhattan. The restaurant caters for all events, offering locally sourced food with varied menus and the culinary delights of Food Network Chef Alex Guarnaschelli. Butter is also equipped to provide any audiovisual needs, with a built-in DJ booth in the Birch Room and a satellite DJ booth in the Great Room. 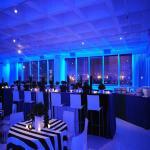 With gourmet food, a warm atmosphere, and incredible sound system, this venue in New York is perfect for corporate events, launch parties, birthdays, or dinner parties, accommodating up to 175. Request a quote today. Do you like Butter? Leave a comment below or on Facebook or Twitter!